Fluorescence is a phenomenon that arises out of the interaction between certain materials and certain frequencies, or energies of light. It is one of the most visually stunning light-matter interactions observable. Who isn’t amazed when invisible light suddenly becomes visible, or when green light turns into red? 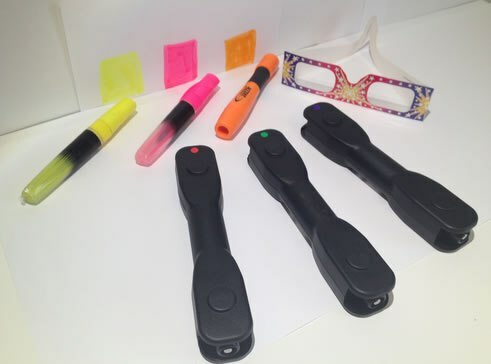 This very simple and inexpensive hands-on, inquiry activity brings the science of fluorescence to light – and qualitatively demonstrates the photoelectric effect. Supplies: Fluorescent markers (yellow, orange and pink), rainbow glasses, and a set of LASER Blox, red, green and violet.